Part of the fascinating potential of stem cells is their ability to provide replacement cells and tissues to treat diseases. In order to do this most effectively, scientists need to be able to create differentiated cells quickly and accurately. However, making differentiated cells can take weeks to months and the resulting cells might be a mixture of the desired type of cell and others. This is because the steps between pluripotency and the differentiated state are not fully understood. To tackle these obstacles, Irving L. Weissman and his team based at Stanford University studied how the cells of the middle layer of the embryo - the mesoderm - turn into 12 differentiated cell types. They mapped out 1) the intermediate cell types formed as a cell becomes more and more differentiated, 2) how these intermediates are formed via alternate paths at each branching point and 3) the signals that encourage and discourage cells to follow a path at each branching point. Identifying the signals that cells receive to determine which path they follow allowed the researchers to make differentiated cells that were 80-99% the desired cell type in days rather than weeks or months. To show that these human cells behave as expected in a living model organism (‘in vivo’), they transplanted the cells that can produce bone, cartilage or smooth muscle (‘ventral somite progenitors’), into mice without an immune system. The cells shown in the image are human cells inside a mouse. The blue indicates cartilage and the light pink indicates bone. 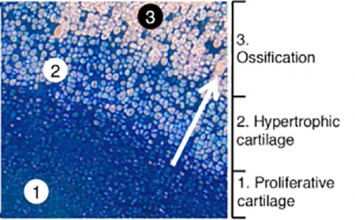 The process of cartilage turning into bone occurs as the blue cells secrete a scaffold of cartilage (‘proliferative cartilage’). The blue cells then enlarge and die (‘hypertrophic cartilage’), and the cartilage they leave behind turns into bone (‘ossification’). The light pink ossified cells are lined in diagonal rows, showing the structure of bone on a microscopic level. The process developed by Weissman and his team mimics natural bone development and shows that the cells produced via differentiation can integrate into a living system properly. This suggests that, with further research, these cells could be transplanted into humans. With this faster, more efficient technique, therapies utilizing such differentiated cells could be significantly improved.